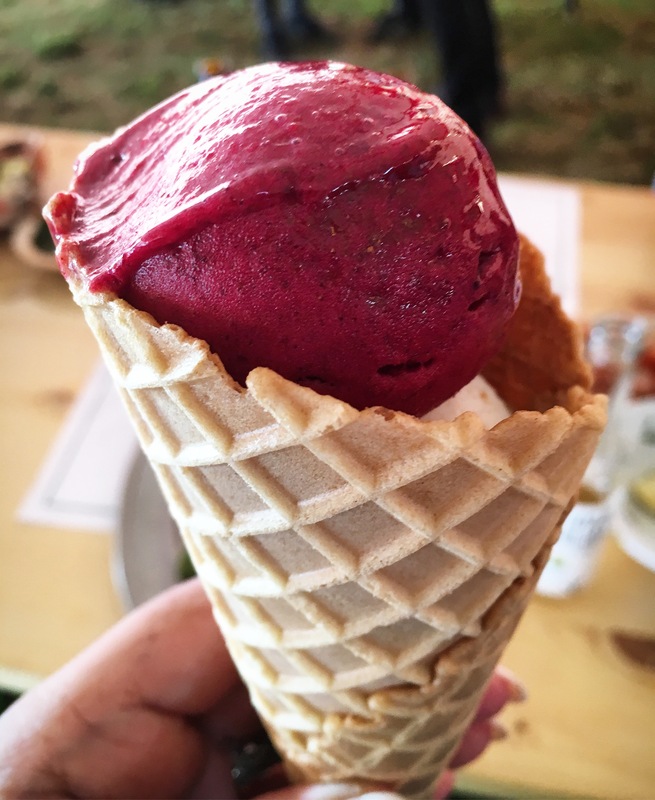 This year the MAD5 symposium brought me back to Copenhagen to attend one of the most awaited food events in the food industry. I arrived in the city basking in the sunshine that would soon disappear during the two days of the event. As in other years the boats were waiting early morning at Nyhavn to transport the attendees to the site which this time had experienced thunderstorms and downpours through the night. The staff handed out rain ponchos guests boarding in the rain shower and one of the first familiar faces I spotted was chef Jacques Pepin and strangely one the last I saw when the event ended a night later. Chef Michel Nischan and I were waiting for a ride after the final dinner and soon as one pulled up someone yelled at us to not even think about it. It was chef Jacques Pepin accompanied by his daughter Victoria who came charging to the car and who would even dare to commandeer his ride! My first morning began at Mirabelle the cafe/ bakery, one of chef Christian Puglisi’s four operations that include Relae, Manfred & Vin, and Baest. An interesting conversation with Puglisi about his latest project, his time in the industry and not to forget the “ladies” his eight Jersey cows that he had taken delivery of just a week prior to our meeting will soon be published. The afternoon took me to a beautiful Danish villa on a picturesque lake for a delicious lunch cooked by chef and cookbook author Katerine Klinken for a group of people under the aegis of the Copenhagen Food Festival. My trips to Copenhagen usually revolve around restaurants and on this visit I visited the newly opened 108 with Noma alum Kristian Baumann heading the kitchen which of course was packed to the gills with people in town for MAD. It was great to see a lot of friends some like guerrilla Gardner Ron Finley from LA, chefs Roellinger and Troisgros with their families from France and others from around the world. During a thunderous downpour chef Magnus Nilsson and I had an intense exchange about his vision of the future of his own kitchen at Faaviken. Magnus is one of the most sorted out young chefs in the world and I look forward to sharing our conversation. A version of my experience at the event as published in The Daily Meal. 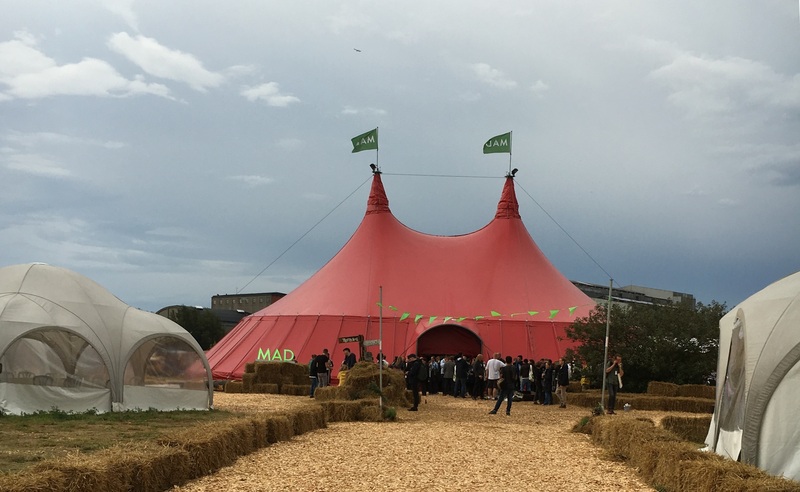 The familiar red big top went up once again in Copenhagen after a one year hiatus on 28-29th August to host the fifth MAD symposium focused on Tomorrow’s Kitchen. 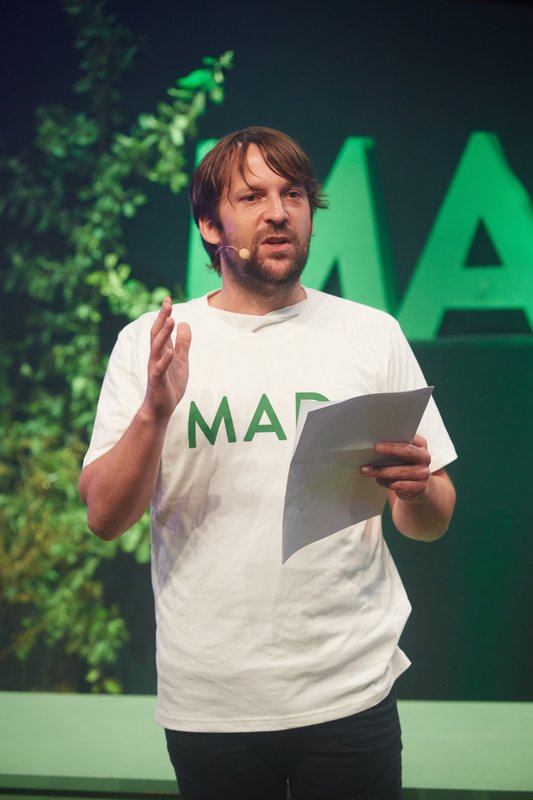 As attendees arrived early morning by boat at the windy, rainy Refshaleøen Island they were welcomed by Chef Rene Redzepi of Noma, founder of the nonprofit MAD Food organization and his hard working team. The movers and shakers of the world had journeyed from various parts of the globe to this event under a tent for a preview of the changes to come in the kitchens of the future. The message, as it wove loosely around the central theme of Tomorrow’s kitchen, was not very different from previous years, even though the theme and the players had changed. 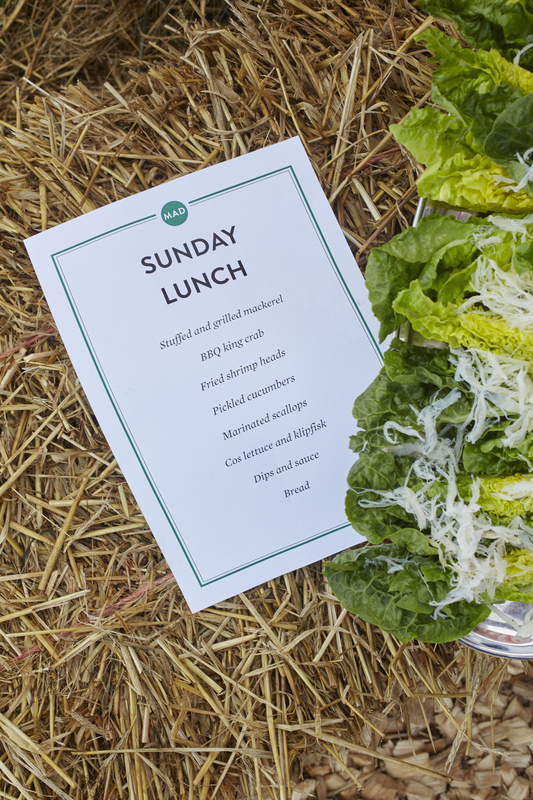 The missive of this much awaited (usually annual) event is that the world of food is interconnected through social, economic and moral issues and everyone in the food industry is part of this new consciousness and can make an impact. Over the years the names have become bigger and the attendees more internationally recognizable faces yet in some odd way it is still imparts the feel of a very intimate gathering where you can sit at the lunch table with Chef Jacques Pepin and even have ice cream served by chef Michel Troisgros! The list of keynote speakers has over the years included luminaries of the gastronomic universe and this year was no exception. Legendary chefs like Jacques Pepin (USA), Michel Troisgros, Olivier Roellinger (France), were joined by chefs Jose Andres (USA), Jair Tellez (Mexico), Rafael Magana (Mexico) to explore the theme of kitchens of the future. 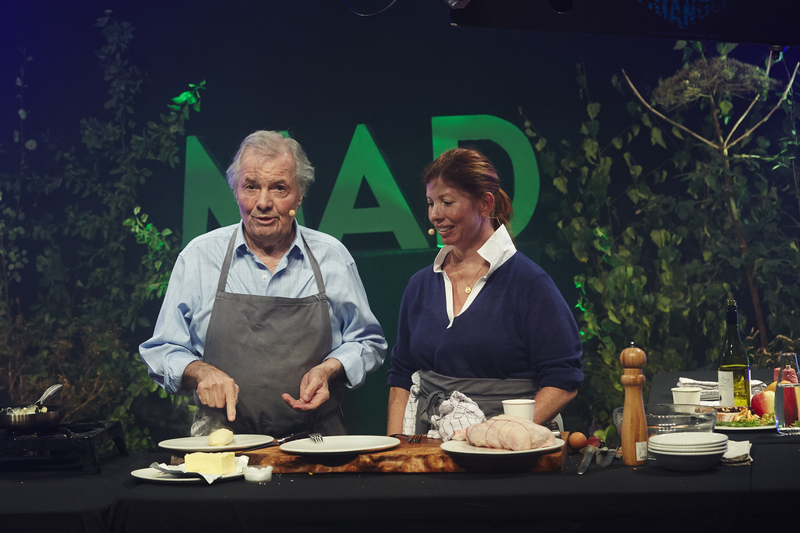 It has become the norm at every MAD event to feature a live cooking demonstration by an icon of the industry and this year was no exception. 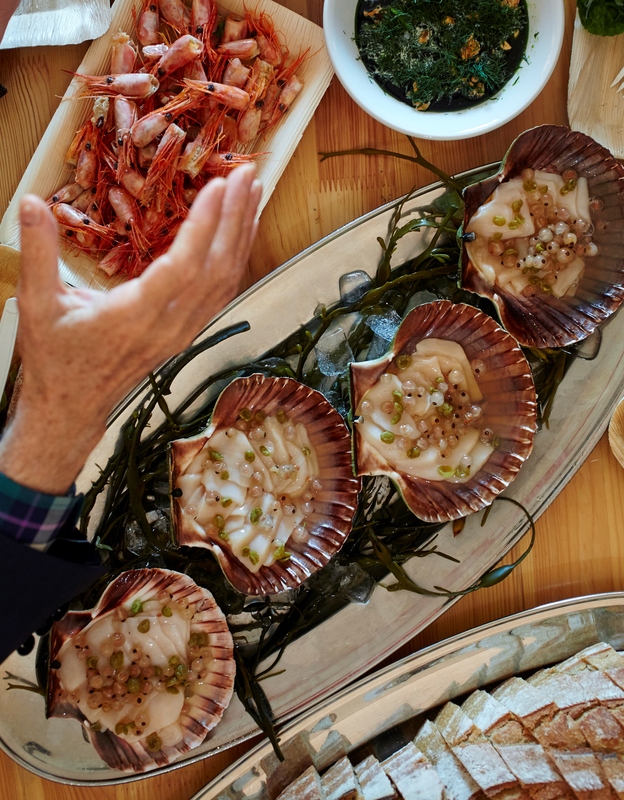 Sprightly eighty-year-old chef Jacque Pepin entranced the chefs, cooks and wannabe cooks in the audience with his monumental culinary skills as he nonchalantly deboned, stuffed and trussed a chicken at lightning speed, his daughter Victoria and a glass of wine at his side. His masterpiece omelette demonstration that followed will undoubtedly become the most watched YouTube cooking lesson, even for seasoned chefs like Jose Andres, who during his presentation shared that it made him want to get to work to right away to perfect his own skills with a couple hundred eggs. Andre’s “One For All and All for One”, barefoot, impassioned discourse asked team leaders to not look up but look down the corporate hierarchy for leaders and companies to focus on flattening or leveling the organizational chart. Paper cups and tablecloths served as props to bring home the point that the kitchen is a competition and we need to embrace it and not be afraid to show weakness even as team leaders. A panel discussion moderated by journalist Francis Lam (USA) with the Chef Fellows (who had spent a week at Yale University in a leadership conference this past June) didn’t quite hit the mark with the audience as they attempted to share their learning experiences. On stage were April Bloomfield (USA), Kylie Kwong (Australia), Alex Atala (Brazil), Jessica Koslow (USA), and Rosio Sanchez (Denmark), but missing Roellinger and Troisgros who had also been a part of the Chef Leadership event by MAD organization in partnership with the prestigious university. Brazilian chef Alex Atala emphasized during this discussion that the kitchens of the future need to learn from the past as to what not to do, to reduce waste and consider recycling back to the farms. Atala said the strongest voice in the food chain right now is that of the chefs, and chefs change when they are the focus of attention and so they must revisit their ethics and morality. The Mexican chef Jair Tellez accompanied by a very droll head chef Rafael Magana entertained the audience with their own hilarious tale of working with family while transforming from farm workers into cooks. If for any unlikely reason Magana doesn’t make it in the kitchen Hollywood could be the next stop for him. The consummate host, Redzepi appeared on stage to serve shots of Mezcal to help the group from Mexico along to the amusement of the rain gear clad audience. Serious protection from the elements was needed over the course of two days from the downpours and winds that circled the site. Kat Kinsman, founder of Chefs With Issues, spoke about the darker side of the industry with its side effects that include burn out, depression and sometimes more tragic consequences as seen in recent years. Yoga, meditation classes, flexible working hours and reducing collateral damage were the hot topics amidst the professionals in the industry. Even Noma now has a resident den mother to succor the staff an idea that will probably be imitated by other operations around the world. The roster of speakers also included Trevor Gulliver proprietor of St. John Restaurant in London, venture capitalist Eric Archambeu from the Jamie Oliver Food Foundation and Sydney Finkelstein author of “Superbosses” took the stage as well though their presentations seemed to stray from the central theme (the super boss theory) especially was challenged during Carlo Petrini’s motivational discourse that followed. On day two, Rene Redzepi and David Chang spoke about teamwork, solidarity, and the basics of the business such as putting a team together, staying creative and even the inability to fall asleep at night due to the stress that comes with the job. 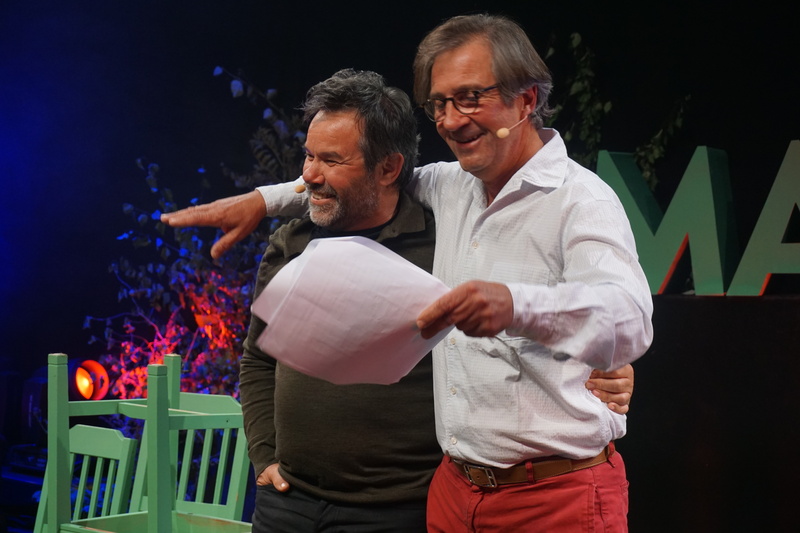 Chang shared that the seeds of the festival were first planted when Redzepi and he met at other events as they climbed up the ranks and often commiserated with each other about their mutual problems in the industry. The nitty gritty of the restaurant business, how to retain or find staff, find purveyors, deal with critics and other issues they found were common to the industry all over the globe. Speaking to the millennials in the audience, they asked them to respect their mentors by keeping alive oral traditions and history. Since “we stand on their shoulders” so listen, talk and learn constantly since the future is yet unwritten. 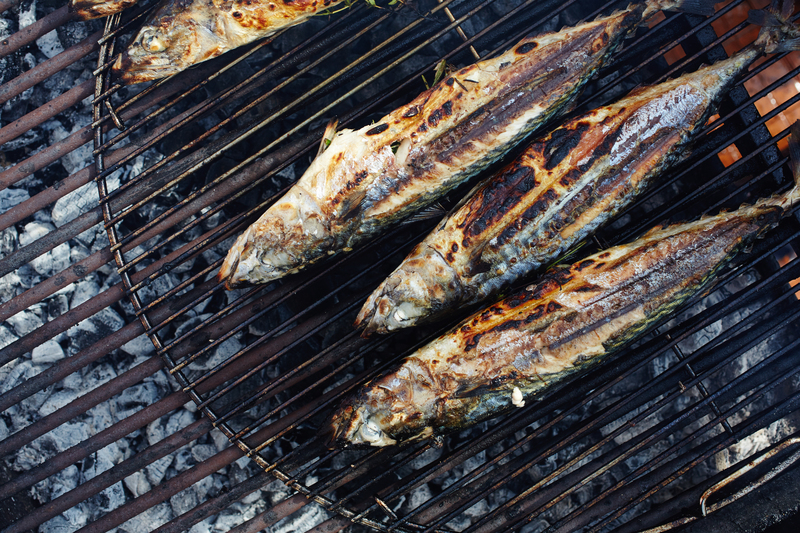 According to Redzepi most millennials had made a choice to be in the kitchen whereas earlier generations had fallen into the industry by default and hence had an important role to play. If anything millennials was the one term bandied about the most during the whole two day event to the amusement of all other generational cohorts, apparently they are the ones taking charge of kitchens of the future. GenX, Y, and Z: move over! 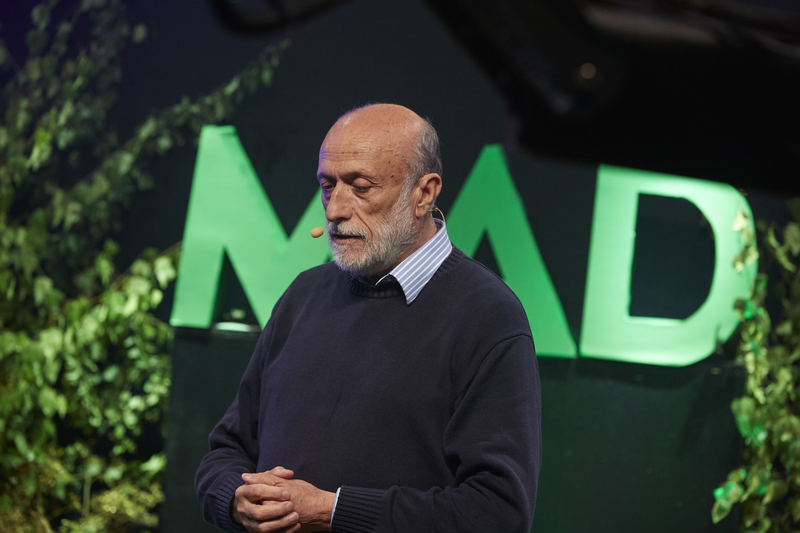 One of the highlights of the two day event was when Carlo Petrini, founder of the International Slow Food organization, rallied the crowd encouraging them to become their own leaders in moving tomorrow’s kitchens forward and changing the food system. Petrini charged people in the culinary industry to form alliances and encouraged cooperation between chefs, producers and people. He asked for compassion in our kitchens and society since cooking is an act of love a message that lingered with the audience. 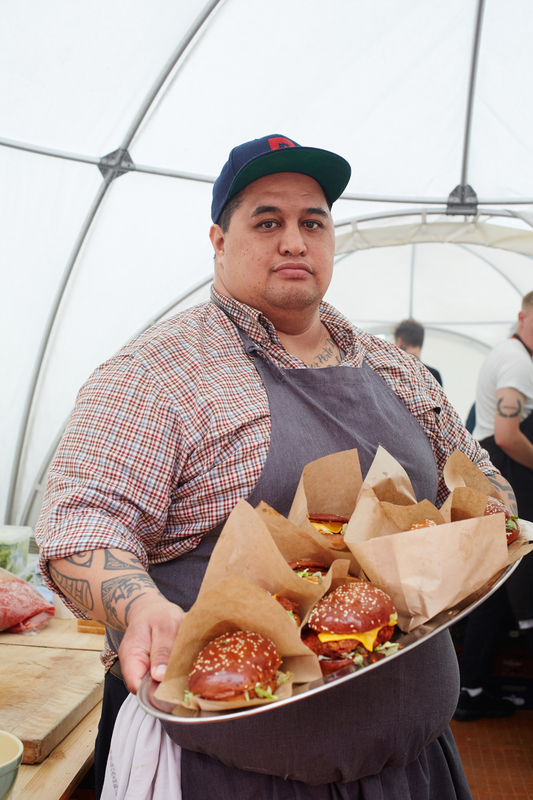 He charged the audience to become a part of this new consciousness and rise up to the challenge of changing the defunct food system. His appeal for aid to the earthquake stricken small town of Amatria resonated with chefs and over 700 of them are now serving their versions of pasta Amatriciana in their restaurants with the proceeds going to help the victims. The duo from France, Chefs Troisgros and Roellinger, spoke about their personal journeys, struggles and their hopes and vision for the kitchens of tomorrow which in their case will be run by their progeny. The lighthearted performance of the two lifelong friends evidently struck a chord with the audience as evident from the resounding applause they received. Roellinger declaimed that all cooks are artisans who have been imprisoned in their own ivory towers but the time had come to break out since the ancient world is collapsing and they must participate to make meaningful changes in society. In a departure from the past four symposiums there were fewer attendees since the invitation to purchase tickets was extended after carefully vetting the applications and proposals. The full schedule of the various group sessions that took place in small tents around the main stage being held simultaneously was taxing since it was difficult to choose and get the most out of the whole experience with people dashing about from one session to the next. Mark Emil the gong master from the MAD team (yes, a real gong) sound out the session times that were displayed on the information wall where everyone milled around during the breaks. 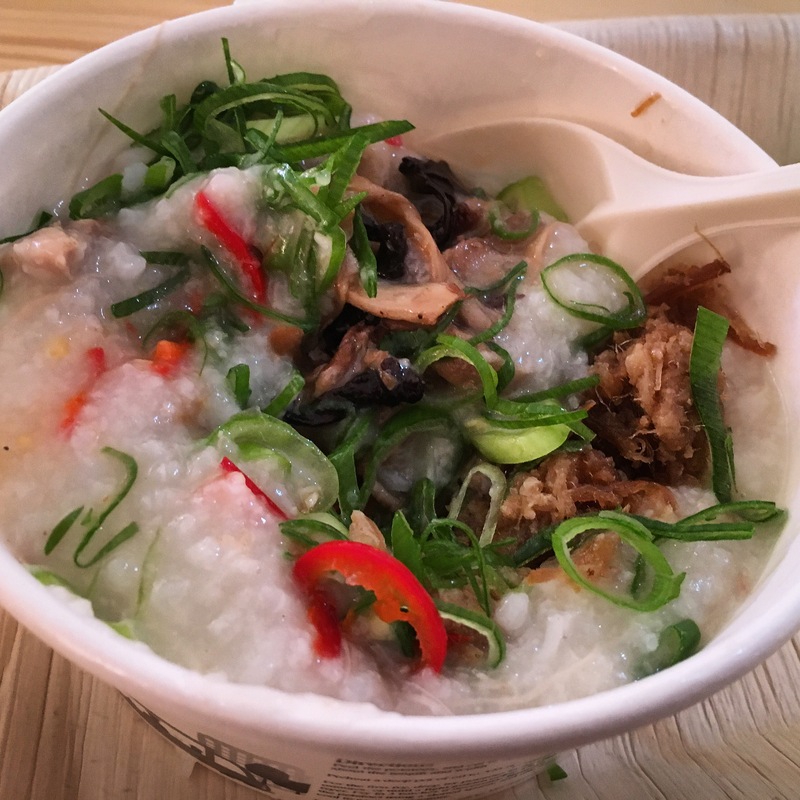 The day began with breakfast in the food tent and everyone’s favorite this year was the savory rice congee (porridge) served by the Lisa Lov aka the Tiger Mom accompanied by pastries from Lagkagehuset bakery and beverages from an impressive lineup of eight roasters and a tea expert. The rain beating down relentlessly on the tent did not in any way impair the appetites of the 300 plus people gathered to enjoy a veritable feast of the ocean served by Esben Holmboe Bang of Maaemo and Roderick Sloan the mad Scot of the North on the first day. The second day’s fiery lunch featured fried chicken and all the trimmings by Morgan McGlone formerly of Husk, Nashville and now at Belle’s in Sydney and was a definite crowd pleaser as the unending supply of crispy wings was all anyone would talk about even at the final dinner that night. 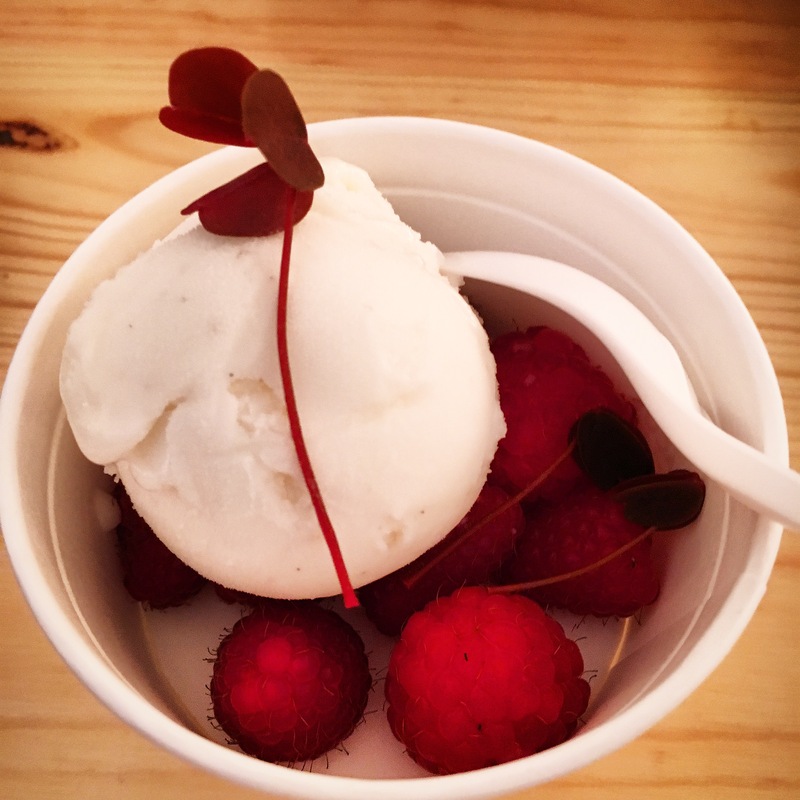 Bespoke beers by Mikkeller and delicious ice creams and sorbets by Jacob & Jakob were at hand during breaks and lunch. The event wound down with a group photo as a camera drone hovered overhead and the final beers were handed out and people headed for the boats waiting to transport them to the final dinner under Knippelsbro bridge. 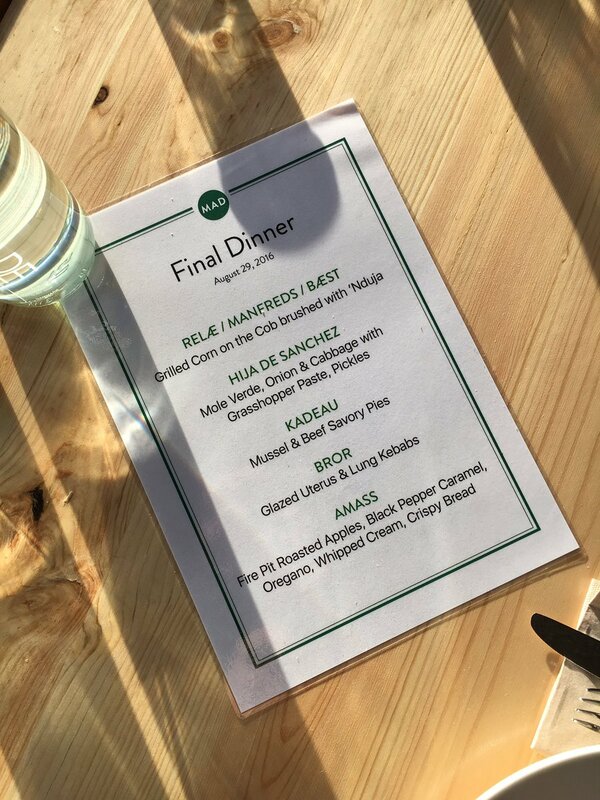 Old and new friends sat at the communal tables to drink and devour the meal served by some of the popular restaurants like Relae, Kadeau, Amass, Hija de Sanchez including the most talked about and dissected course of glazed uterus and lung kebabs from Bror. It was the early hours before the eighties-tinged music (apparently tracks Redzepi discovered by happenstance) and enthusiasm of the crowds died done and they moved to the after parties around town. Thus ended one of the most talked about international food events of the year leaving images, ideas and thoughts for the participants to ruminate and reflect on. 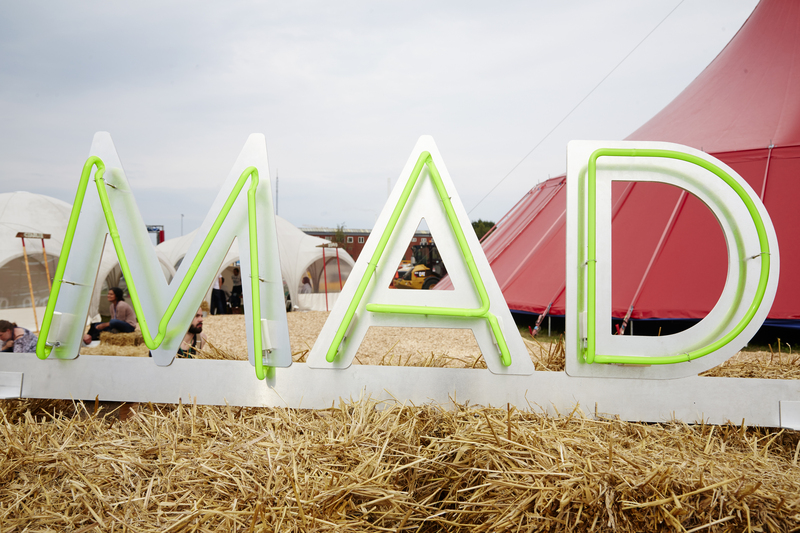 As to MAD6 as Redzepi said the future is unwritten.